Mercury! Poisonous, yes. Liquid metal, yes. Addictive gameplay, most definitely! The aim of the game is simple. 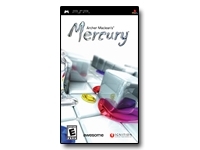 While not spilling too much, guide your mercury blobs around mazes, levels, platforms, problematic end-of-level bosses, and numerous unwanted obstacles and enemies to channel your mercury to the finish point. Each new level introduces increasingly difficult logical tasks - from simple switches and one-way gates to complex Tesla spark towers that can instantly zap your blobs into a vapor!